The DT-209 electronic digital theodolite series represents the pinnacle of Topcon theodolite technology. It effectively integrates the latest, cutting-edge electronic and optical technologies into a singularly effective theodolite that consistently provides accurate measurements and superior reliability. 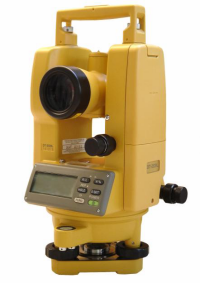 Topcon theodolites incorporate the same high quality absolute circle reading technology that you'll find in Topcon total stations. This ensures the absolute highest accuracy and reliability and means that your measurements are always 100% correct. The DT-209 series provides excellent results in the field owing in part to its lightweight yet extremely rugged design. Superior protection against moisture and dust means that no matter how challenging your work environment you'll always get rock-solid accurate results from your DT-209. In addition its easily understood LCD interface and simple controls make it easy for anyone to quickly begin taking accurate measurements on the job. The DT-209L laser theodolite adds a 633nm Class II laser which is visible in direct sunlight at distances up to 165 feet. It allows for easy sighting of your target without having to look through the telescope. Additionally the laser proves advantageous in low light conditions such as in tunnels or mines where sighting the target through the telescope is either difficult or impossible. The DT-209L electronic laser theodolite is designed to save valuable time on jobs that involve numerous measurements which need to be taken repeatedly. Topcon theodolites are designed to get you up and working quickly while consistently and reliably providing the highly accurate results that your work demands. If you're looking for a superior digital theodolite you can safely rely on Topcon as they are a trusted leader in positioning technology. New and used Topcon DT-209 and DT-209L theodolites available on eBay. Easy to operate - an intuitive interface coupled with the easy-to-read, high contrast backlit LCD display ensures that anyone can get to work fast regardless of previous training. Compact and lightweight design for easy portability between job sites. Superior IP66 water and dust protection coupled with rugged construction ensures flawless performance in the harshest environments. Optical plummet for quick and simple setup over a control point. Excellent battery life - energy-efficient design provides up to 170 hours of continuous use.